Oh sweet, sweet Olivia! This little lady broke my streak of boys~ can you tell how excited I was to break out the pink, lace, and florals? Don’t get me wrong, the boys are just as fun and adorable, but being a mom of girls, this is in my wheel house! Olivia’s mommy had her newborn session about a month prior~ it’s so much fun to get to know these families before their little ones arrive. To see her maternity session, click here. 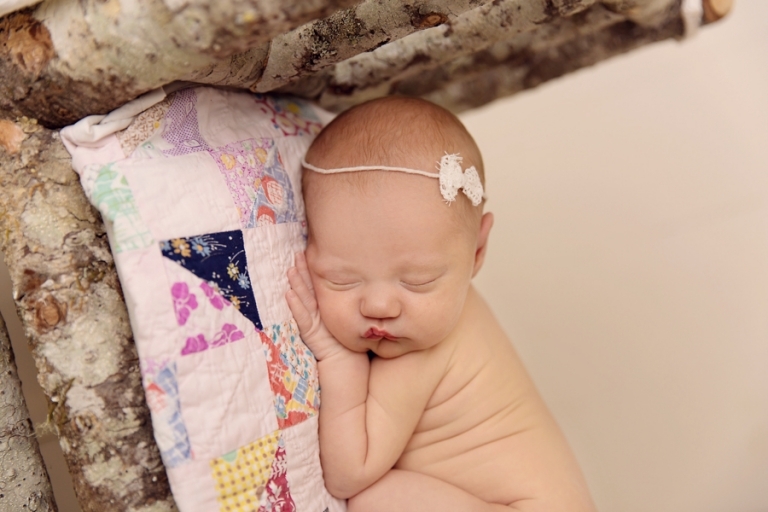 Now that Olivia has arrived, it’s her turn to be featured on the blog! This lace backdrop from Roses and Ruffles is hands down my favorite drop for little girls~ especially the neutral color, it’s so timeless and gorgeous! 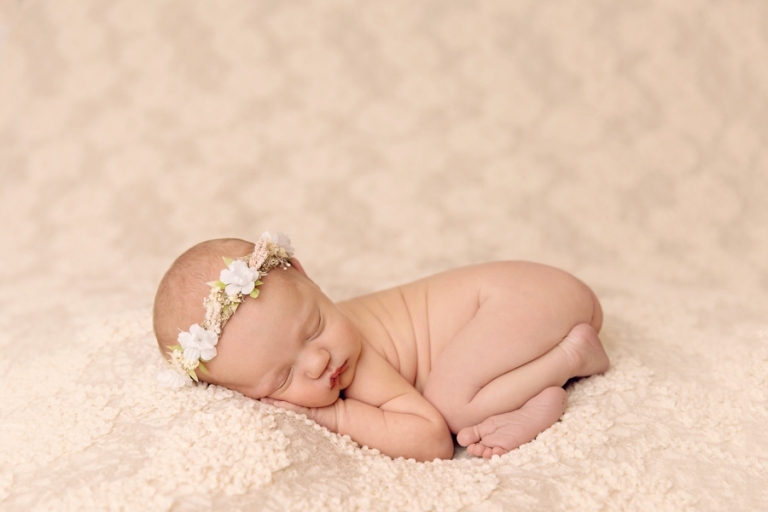 Add in this halo from Baby Bliss Props and my favorite pose and I’m in love! Oh those little rolls, and feet! 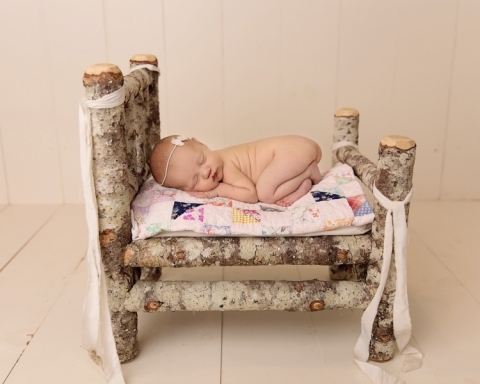 This little wooden bed gets to many requests! It’s so rustic and simple- I love this quilt from 3 strands, it pairs perfectly for a cozy rustic look that’s still girly! Well, it appears that fall has finally arrived this year and after having so many requests for the purple wreath that I made last year, it was time to make a fall version! Don’t worry friends, this babe was nice and safe, no dangling babies in danger here! This is a composite, meaning two photos put together in Photoshop. 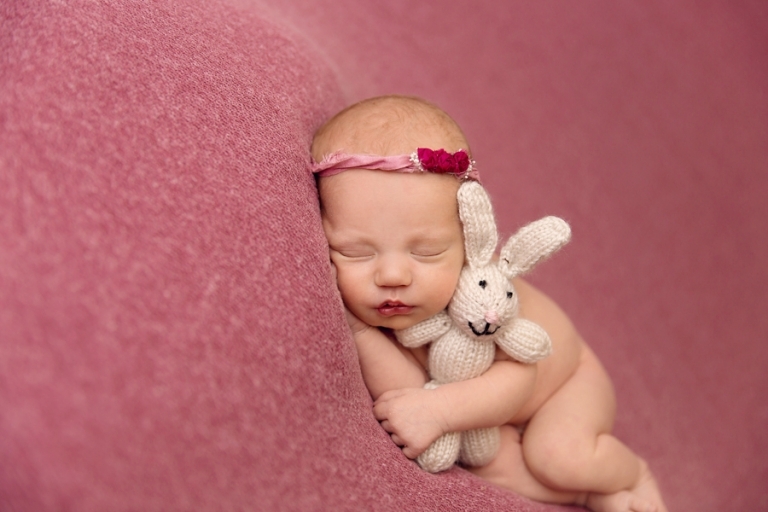 Mary Christine Photography is a Cleveland Photographer specializing in newborn photography. She serves greater Northeast Ohio, including Cleveland, Akron, Medina, Wooster, Brunswick, Wadsworth, and surrounding areas.